An ideal choice for cooking enthusiasts, Simply Calphalon Nonstick cookware brings durability, performance and value to your kitchen. 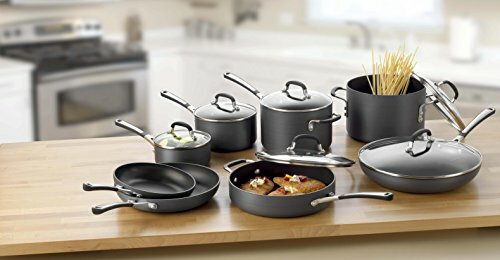 Long-lasting PFOA-free nonstick surfaces consistently deliver delicious results followed by easy clean-up, while durable hard-anodized aluminum construction promotes fast and even heating. Silicone handles feel comfortable and stay cool on the stovetop. The 8-in. and 10-in. Omelette Pans are useful for a wide range of recipes and cooking techniques. Designed with a flat, heavy bottom, each pan has a wide surface to maximize your cooking area. Sloped sides are designed for easy tossing and rolling. Pans are oven safe to 400 degrees F. Hand wash. Cook on gas, electric, or ceramic stovetops. Covered by a Full 10 Year Warranty.